I tuned into the Giants – Phils game five today. Good game but for the likes of me I cannot understand why teams are handing out pom poms. It looked as if everyone at ATT Park tonight had a bright orange pom pom. It is hard enough trying to watch a game nowadays when the 11 year old kid in front of you has a foam finger and oversized foam rodeo hat and the vendor with the rainbow cotton candy ( it is no longer pink , folks) is obstructing your vision every couple of innings. But can you imagine trying to watch a ballgame when EVERYONE in your section is waving a bright orange pom pom ? I certainly can’t. Unfortunately, most of the teams encourage this pop frenzy. There are a few exceptions like the Yankees and Red Sox. Indeed, the vibe at the ballpark these days – with the blaring music, dot racing, kissing contests, food courts, and pom poms is more similar to an amusement park than to a ballgame. 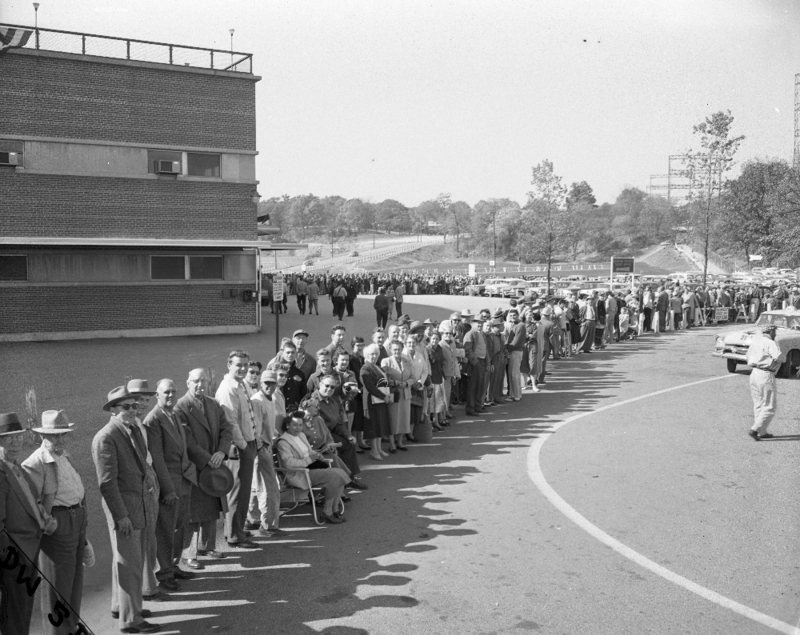 Contrast this to the baseball crowds of old, like the photo above of Milwaukee Braves fans lining up for the World Series in 1957. Do these look like the kind of people who would be waving pom poms ? I think not. 1.) The Giants have turned their back on tradition. Of the three original NY teams, only the Giants wear uniforms different from those they wore in NY. The Dodgers and Yankees wear the same uniforms in 2010 that they wore in 1960. The Giants,on the other hand, have changed their uniform style at least five times since moving to San Francisco. For years fans clamoured for the team to bring back the the uniforms of the Mays, McCovey & Marichal era. When the ownership changed hands in 1993, the marketing dept said they were bringing back the old uniforms but what we got, and what the Giants still wear 17 years later, is a bastardization of that classic 60s look. The lettering on the road uniform is too small and on the home uniform too large. Why they just couldn’t replicate every detail of the old uniforms, as the Yanks and Dodgers do, I have no idea. Stupid. 2.) Neither the Yankees nor the Dodgers have a mascot, obviously aware that such buffoonery is not befitting of their august traditions. The Giants, on the other hand, have pandered to the masses with mascots such as “The Crazy Crab” and “Lou Seal.” Mascots are for expansion teams ( the teams are usually so bad management has to come up with something to entertain the fans) not for time-honoured franchises. 3.) 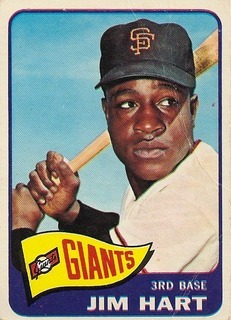 The Giants have no Bob Sheppard, no Vin Scully, no Ross Porter. The Management simply hasn’t seen fit to attach any importance to continuity in the broadcast booth, failing to understand that fans sometimes grow to love a team because of the team’s announcers. Although the team’s current announcers, Mike Krukow and Duane Kuiper have established themselves with local fans, beloved broadcasters of an earlier era were discarded like empty milk cartons. Once again, management has turned its back on tradition. Sheer stupidity. 4.) Giants fans cheered Barry Bonds as he was being indicted on perjury charges, oblivious to his deep moral flaws and failing to understand that the Giants, as one of the older franchises, have a standard to uphold. Bonds was quite simply a disgrace to a franchise that boasts the great names of McGraw, Mathewson, Hubbell, Ott, Mays, McCovey et al. But even today Giants mangement and fans embrace him. 5.) The new breed of Giants fan is a transplant. He has moved to the Bay Area to work in the computer industry where he makes well over 100K a year. His car of choice is a BMW or mini-Cooper and he reads books on Kindle. He is ignorant of the history of franchise and goes to a game just because it has become “the thing to do in San Francisco”. He spends much of his time at the ballpark on his cell phone or waiting in long lines for garlic fries and a gourmet burger. He wears a replica jersey. If you go to a Giants game nowadays and the guy next to you is a slob with mustard stains on his shirt who knows who Jim Ray Hart is then you have won the lottery. Alas, usually they have never heard of him and you are left sitting there in silence staring at your beer …..and wishing “Lou Seal” would just go away. We had noticed an escalation of Seagulls at SF Giants games through the first third of the 2009 season. Under normal conditions, as patrons leave the ballpark gulls will come into feed on the unfinished food and debris. This season however there seemed to be more gulls than usual and we had also identified the presence of a “Recon Gull, ” a lone gull that would appear in the stadium several innings before the flock. The “Recon Gull” we identified as a Red-Legged Kittewake ( Rissa Breverostis) , a species more known for its large eyes and keen night vision than scavenging. 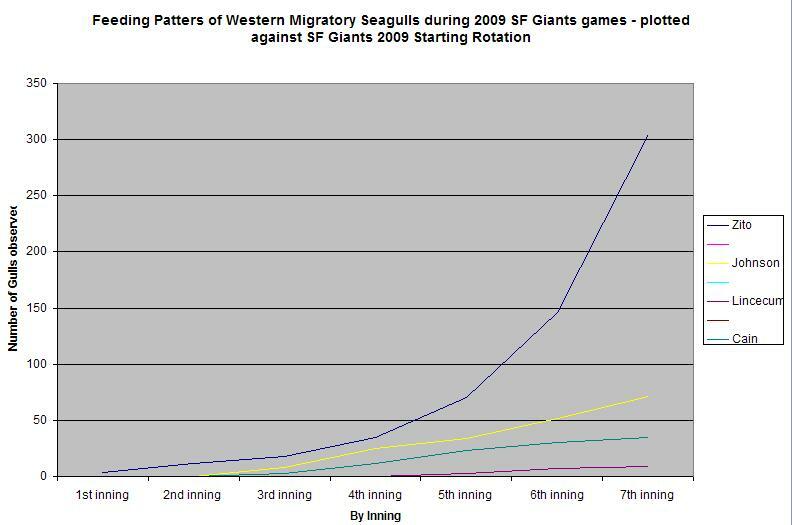 In order to gain an understanding of this phenomenon and to establish a possible link between gull feeding habits and the SF Giants 2009 rotation we conducted a field study over 10 games. As most bird migration occurs at night (Wilzack 1995) our field study took place over 8 night games and 2 day games. We measured wind speed using current algorithms and have assigned a tolerance of – 2 for large bird clusters per starter. This methodology is consistent with Obannon (1972). Based on our observations we were able to establish a clear link between Giants starting pitcher and gull populations inside ATT Park. We also noted the presence of several “Recon Gulls” as early as the first innings when Barry Zito was on the mound. This is unusual because not more than one “Recon Gull” was observed when the other Giants hurlers were on the mound. We hypothesize, therefore, that of the 3-4 “Recon Gulls” observed when Zito was on the mound, only one was a true “Recon Gull” the others most likely being Ring Billed Gulls ( Larus Delawarensis ) a species that is omnivorous and will scavenge on anything. For the complete findings please click on graph.